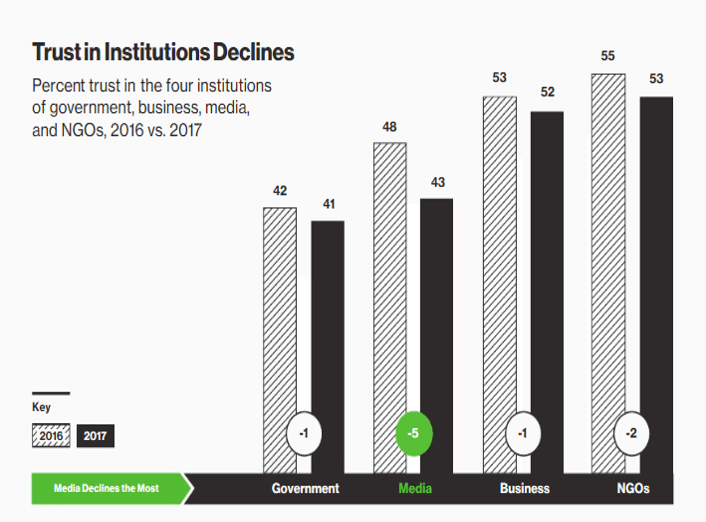 The 17th edition of the Edelman Trust Barometer was released at the beginning of this week, showing a major decline across all four institutions. The four institutions included the government, media, business and NGOs. The institutions and declines can be seen in the image below. What is the trust barometer? The Edelman Trust Barometer surveys tens of thousands of people from various countries, analysing their levels of trust in business, media, government and NGOs. Starting off as a survey of 1,300 people in five countries in 2001, the survey has now grown into a global measurement of trust across the world. The people surveyed are between the ages of 25-64, are college educated, have an above average income and either read or watch business and news media several times a week. The media saw the biggest decline out of all four institutions. Respondents favoured the use of search engines, rather than human editors. And with the rise of Fake News, I would think the trust level for the media has declined even further. The media are now being seen as ‘elite’ and ranked alongside the Government for low levels of trust. Media outlets are having to take a more social and engaging approach to gain back that trust. CEOs saw a huge fall in their trust stats. Employees came out on top in each segment to be the most credible spokesperson. 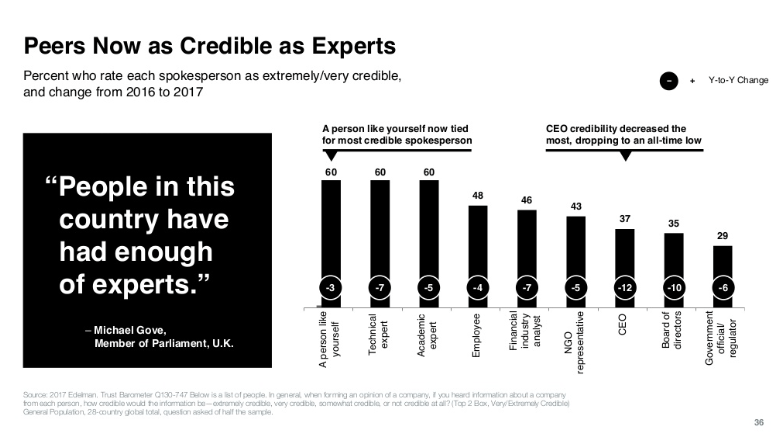 This is quite worrying as the CEO should be the most trusted in the company, as the whole company is being led by him or her. More must be done between levels of the hierarchy to make sure leaders are being seen as credible in the workplace. ‘A person like yourself’ tied for the most credible spokesperson with the government ranking as last. This can be seen from the rise of the influencer when it comes to public relations. More brands are using normal, non-celebrities to promote their products through social media as they’re seen as relatable to the everyday person. This person may not have millions of followers but a few thousand is suffice. These self-made celebrities are making a fortune through advertising on their social media. This causes real concern for the government as they are not seen as a credible source. Communication seems to have taken a horizontal position as peer-to-peer instead of vertical which would’ve involved the government down to the individual. Most would think the decline may have been a result of the recent Brexit campaign and outcome, as well as the new POTUS. However, the survey was carried out before the Brexit vote and before the United States elections. So it would be interesting to see how these results would change if the survey was carried out again now, since Brexit and Donald Trump. (I did a post about Mr Trump last week, you can check it out here). These are only a few of the changes that were highlighted in the report. You can view the full report at Edelman’s Trust Barometer 2017 – (there’s 66 slides of info, prepare yourself). The information displayed in Edelman’s Trust Barometer shows that businesses need to gain control and make changes. They need to listen to their stakeholders and answer their frustrations so that they can regain the trust. Better communication and engagement is vital between all stakeholders of the business so that the business can move forward and progress, and eliminate the fears that stakeholders have. 82% of people surveyed no longer believe in the system. Most of the headlines surrounding this year’s Trust Barometer Report read ‘Trust in Crisis’ and rightly so. It is clear that major work needs to be done to improve the levels of trust between all institutions. Society are depending on their peers and individuals like themselves for truthful information. The masses are no longer relying on the media or government but turning to search engines for the news. Going forward, all businesses must analyse how they use the media, their social networks and how they treat their employees in order to improve trust levels. The businesses must see their employees as a source of competitive advantage and not as money-making resources. If we don’t have trust then what hope do we have?